For any feedback please feel free to write in that thread. We're glad and proud to inform you that we are opening the beta testing phase of our free and open source software Eddie for Android. Currently Eddie for Android is not exclusively designed for the AirVPN service: it's almost the equivalent of OpenVPN Connect, so users are required to generate profiles through our Configuration Generator, and of course it works with our competitors as well. As you obviously may expect, we assure you that integration with AirVPN services is definitely planned in future releases. Source code is available in GitLab: https://gitlab.com/AirVPN/EddieAndroid . Are you able to distribute the APK without having to sign up to the Google testing page? When clicking the 3 dots to browse for a profile an empty popup comes up with no possiblity to browse for a profile. The default path for the config file is the Download folder. And the default name is profile.ovpn. So basically, create some config file, rename it to profile.ovpn and copy it to the Download folder on your Android Phone. I hope they make it more intuitive later. I've did a quick test and it works OK. No IPv6 leaks either! Edit: Not sure how to properly upload a screenshot here. Edit2: You CAN choose between the config files when they are in the Download folder. So, basically, just put the configs in the Download folder and it works. I tried Eddie on my Sony Xperia Z5 Android 7.1.1 and when I visit Ipleak.net I get a WebRTC Leak. How do I prevent a WebRTC Leak in Android? Couldn't find anything on the Internet. I also couldn't take a screenshot for whatever reason. Thanks. Picture upload doesn't show up when quoting for some reason. Also, IPv6 test with Castor. Really good work. I have some serious lock issues on S6 Android 7 when accessing the log page. Need to restart the phone. Where is the correct place to do bug reports? Exciting! Have you also considered releasing on F-Droid, for those who do not have Play Store access? I've been using the Eddie for Android beta the last few days. So far it seems to be working well but the UI is taking some getting used to. The biggest issue I have is the persistent notification. I know it is necessary to an extent for keeping the app open and working in the background but since Android already shows the key icon in the notification area, it ultimately becomes redundant. Personally, it's distracting to have an icon there that isn't an actual current notification that needs to be seen. 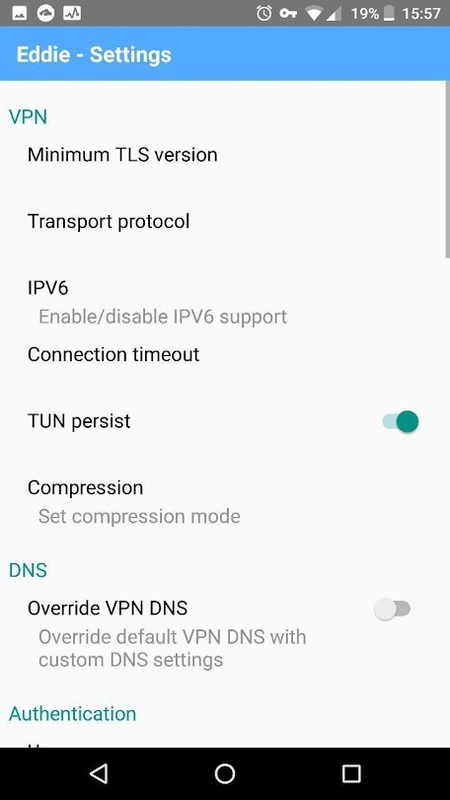 I feel OpenVPN for Android handles this well as it uses a low-priority persistent notification that does not show an icon unless the connection gets disrupted and it needs to reconnect. If you pull the notification drawer down the persistent notification displays connection information. That notification is very useful as not only is it informative but it allows you to disconnect/reconnect the VPN without having to open the app. As it is, the Eddie notification only tells you something that is obvious: "Eddie is running." Similarly, something confusing that could be easily fixed through UI is that the app seems to auto-reconnect after losing the connection. This is obviously the desired result but confusing as it's not obvious what is happening as the icon simply disappears until the connection is re-established. As mentioned above, the way OpenVPN for Android mitigates this is to display a temporary notification showing that the connection has been lost and an attempt to reconnect is being made. This would be very helpful to cut down on any confusion otherwise new users might think they have to manually restart the connection to AirVPN. These obviously aren't deal breakers but for an app that would be running all the time it would greatly increase the ease-of-use. ZTE Z798BL TracFone Stock Android Marshmallow 6.0.1 works perfectly and MUCH faster than OpenVPN for Android! Works perfectly, no leaks. Edit: I have intermittent disconnect issues related to the client quitting. I haven't figured out what's wrong yet but when I do I'll update this post. 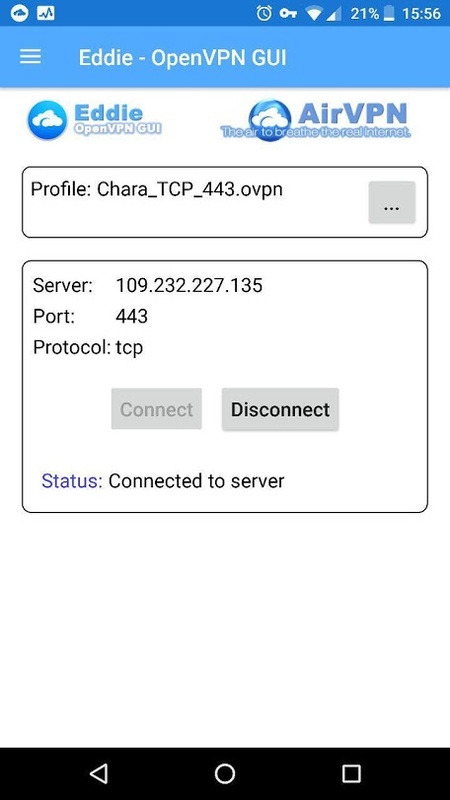 Works fine with OpenVPN Connect and Openvpn for Android. Will this new client support ChaCha20-Poly1305 or AES-GCM ciphers? The AES-CBC cipher that the generated configuration seems to use currently is pretty heavy on phone batteries (especially older ones without AES acceleration!). My phone is losing battery life at twice or thrice the rate compared to just leaving 4G data connection on without the VPN tunnel. Will you make this available as a binary for Android devices that don't have the Play store such as Fire devices? 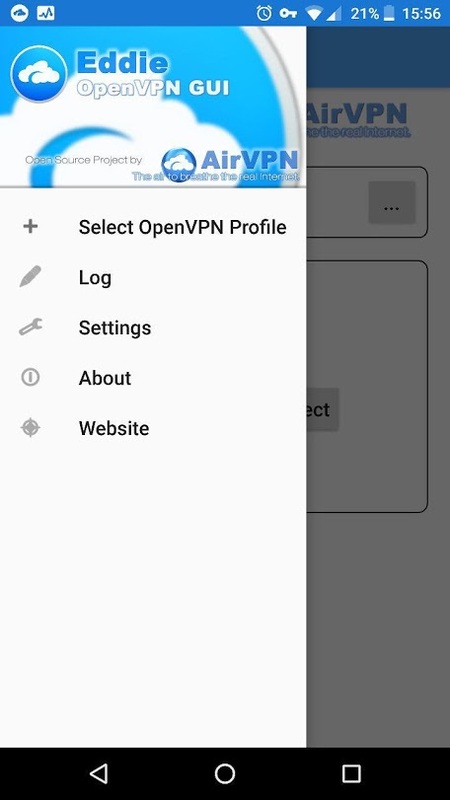 Have been using an Android app called 'OpenVPN Client' for around a year with the AirVPN service. It has a great feature that allows you to specify safe WiFi zones, this will disable the VPN as you connect to the predefined SSIDs and reconnect as soon as you leave those zones. This is great for battery life and good from an AirVPN service perspective as it avoids me having multiple unnecessary connections when I arrive home and establish a connection to my network. Does the new Eddie Android Edition support this feature or could this be introduced in a future release? Wonderful news! Could you please make this available through F-Droid repository? Yes, I also would highly prefer this also. Yes, this is planned for the near future. We are preparing a new release, with a new ID, which we plan to publish on F-Droid as well. In the meantime, please use the direct link to download the apk from our servers. You can find it in the first post of this thread. We're very glad to inform you that a new version of Eddie for Android has been released. The application ID is now org.airvpn.eddie and the released version is 1.0 beta (UPDATE 21-Sep-18: Release Candidate 5 is now available, please see https://airvpn.org/topic/26549-eddie-android-edition/page-7?do=findComment&comment=77774 ). This release replaces the previous one completely and we recommend that you switch to it. Alternatively, if you don't want to access (or you have no access to) the Google Play Store, the apk ill be available soon in our web site. We aim to speed up the release cycle from now on and we confirm that Eddie will be more and more integrated with AirVPN with the progressive implementation of several functions and options that you can find in Eddie for other platforms. In addition to ARM64 support, various bug fixes, improvements and changes have been applied, including changes aimed to make Eddie more consistent with Android design best practices. For a detailed list, please see below the attached changelog. The project has been assigned to a new developer (you can see a credit mention in the changelog) under the supervision and verification, as usual, of Eddie lead programmer Clodo. Please feel free to write in this thread about this new release, what you like and what you hate, and of course any detected bug. Sure! This is planned. Together with various other features you find in Eddie for other platforms, it will be implemented. Using a Pixel XL phone. Android 8.1.0. 1) The log timestamp is completely wrong. Plus not in the phones local format, instead in the US format. 2) In the Client Area, it shows the connection as "OpenVPN client:	3.git:master"
It's not "wrong", it's just in GMT to have a shared time frame without having to ask each user for their local time. In this way it's possible for us to correlate some issue with (if any) VPN servers problems and quickly discern whether the issue was on our side or not. About the date: it is of course possible to implement a local date format and export it in UTC. Log generation will be anyway deeply reviewed because the current implementation loses too much info from OpenVPN 3, and we will consider this option seriously. 2) In the Client Area, it shows the connection as "OpenVPN client: 3.git:master"
Good. We left the OpenVPN default included in the GitHub source code we compiled. Tag version "3.git.master" identifies (currently) the latest OpenVPN version. Keep testing, thank you very much! Getting crashes on LineageOS 14.1 using my device. Noted. One of our physical testing machines is Lineage 14.1 based so we can try to reproduce the issue exactly. Can you please tell us whether you tested the previous "com.eddie.android" application? If so, can you please check and report whether you still have the Mono shared runtime library installed? If so, please delete it and check whether the crash still occurs.